The most successful and happy people in the world are the ones who RECOGNIZE and CLAIM their natural strengths, USE them in their personal and business lives, and VALUE the talent differences between themselves and others. But how can you determine what your natural strengths are? After all it's not like you were born with a certificate listing your natural strengths. You can ask other people what they think your strengths are and that can be helpful, but not necessarily all that accurate. People see and experience the world differently (for example do you see a young girl or an old woman in the picture at the left?). It's those perceptual differences that are the basis of natural strengths. And to complicate things even more, if you are like most folks, you probably assume that because something is easy for you, it must be easy for everyone else. So you discount your own unique gifts and talents. This is where the Perceptual Style Assessment (PSA) comes in. This powerful, one-of-a-kind, scientifically accurate assessment provides you with the information you need to recognize and fully claim the strengths and talents that are uniquely yours. As part of the Your Talent Advantage Owner's Manual series, it enables you to put your natural strengths to work in all aspects of your life. While the science behind this assessment is sophisticated (click here to read all about it), taking it is simple. The assessment questions are neutral and noninvasive: you’ll be asked to rate adjectives on a five point scale according to how well they describe you. The Internet-based assessment takes 30-40 minutes on average, but you don't need to complete it all in one sitting. You can save your answers and continue at a later time. 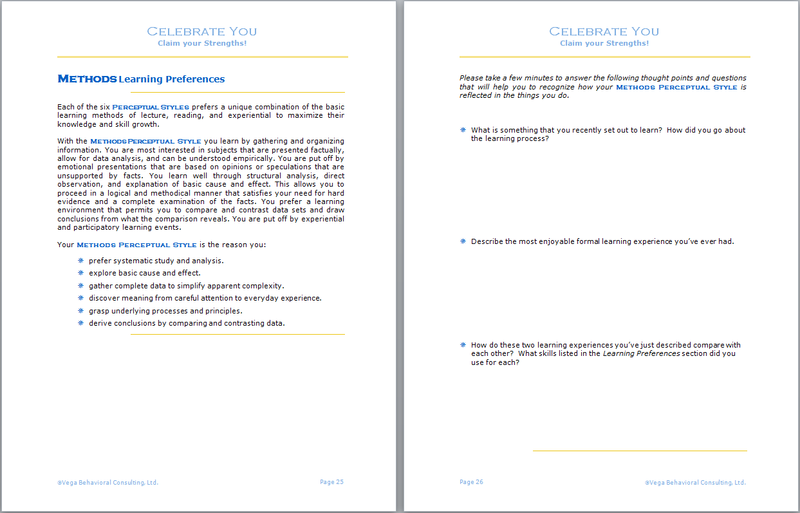 And best of all, you’ll receive your results - Volume 1: Celebrate You of the Your Talent Advantage Owner's Manual series - almost immediately after you submit your assessment. The PSA is available on a stand-alone basis and is used as part of several of our programs, as well as by independent coaches who value the one of a kind results the PSA delivers.